One of the best things about my job is that I get to play with some super cool toys. It helps that I am a big kid at heart so I can normally predict exactly what the children will think before they review something – making product screening so much easier. One toy that I was keen to get my hands on was the Air Wars Battle Drones. When I say forget the kids I want it, I am not joking!!! These are blooming brilliant. When they arrived of course everyone was excited and wanted to have a go. These have been designed to be light weight hence they don’t have replaceable but rather a smaller inbuilt rechargeable battery. 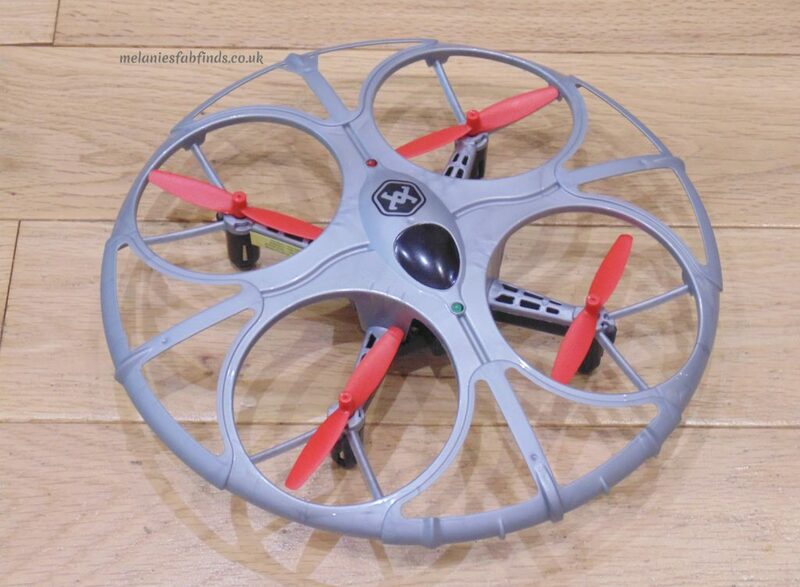 The drones are for indoor use not outdoor use as the wind can easily whisk them away. They have been designed for battle against each other so go for it and have fun! Top tip, read the instructions and you will be well onto your way to mastering flying your drones. 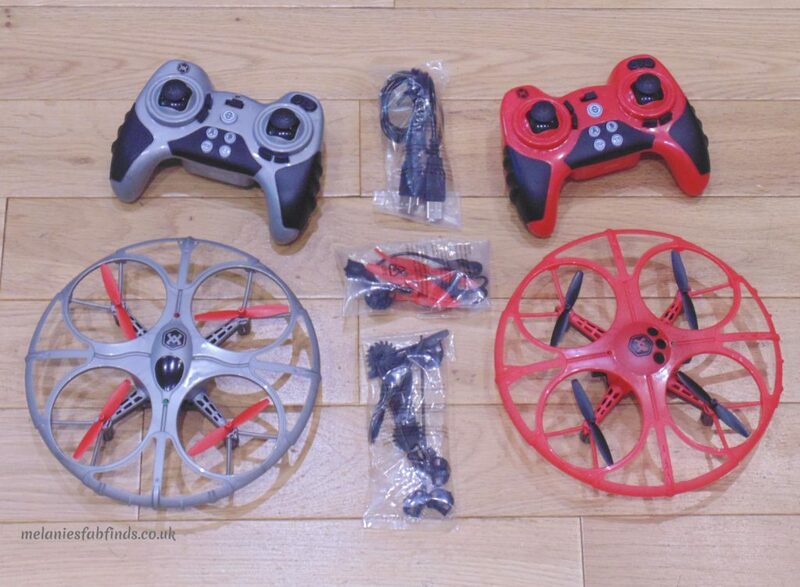 You need to pair each drone to a controller which I will tell you how to do shortly. 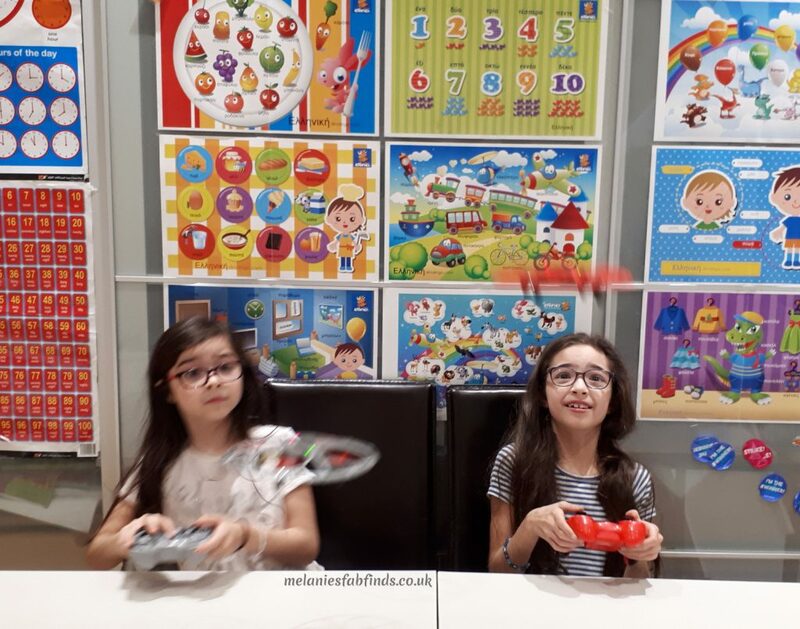 The girls are still getting the hang of the drones but they are getting better. It is aimed for ages 8+ so around their ages one being 7 and the other 8 and a half. Read the instructions before you start or simply read this post. To get started make sure the drones are charged. They come charged at 50% so technically you can start straight away. Remove the paper in the controllers so that the batteries can connect and the current pass through for them to work. Turn on one drone via the switch underneath, the red and green light will flash continuously. 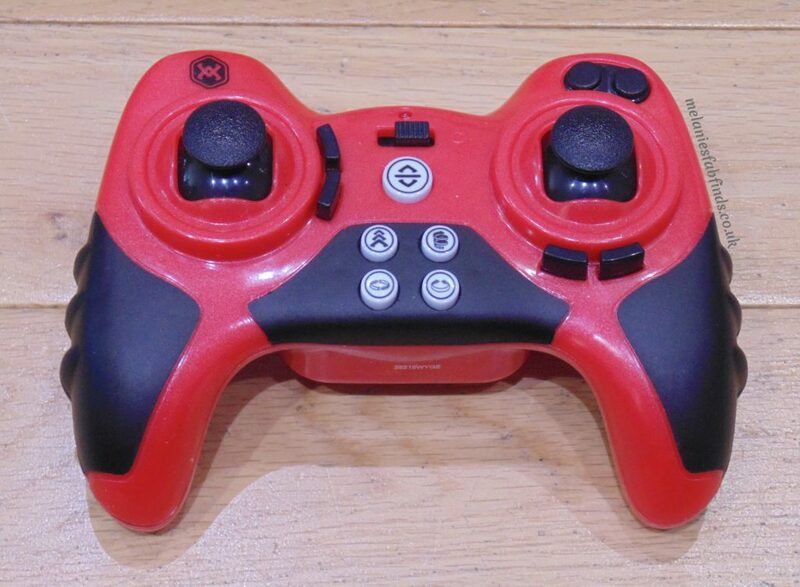 Turn on the corresponding controller via the switch on the front and then move the left joystick up the controller will beep once, move the controller down and the controller will beep again. When the pairing light (the little light on each) stays on for both the controller and drone you have paired them. Repeat with the other drone and controller. Once both have been paired you are ready to battle. There are various programmed attack modes which we have yet to master including the ram attack, tornado attack, 360 degrees spin attack and the circle attack. Small steps, we will get there soon enough I’m sure. At the start the white button in the middle is the most important button you will need. It is the auto take off/ auto landing button / emergency stop button (when pressed for 2 seconds). The girls think these are wonderful and want to play with them every day!!!! Perfect for me as I can get homework over nice and fast without any problems. This is a great unisex gift that every child is going to love. 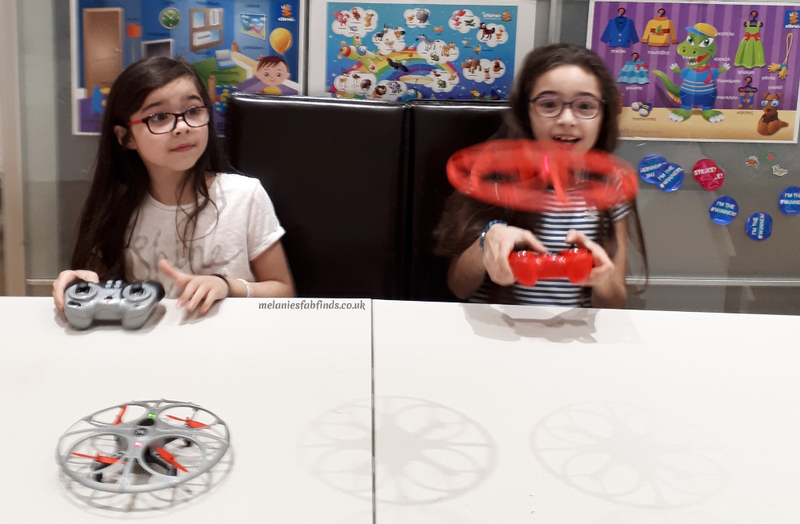 Having played with the drones I have to say these would definitely be on my you’ve got to get these for the kids list, they are fantastic!! What do you think of the Air Wars Battle Drones? 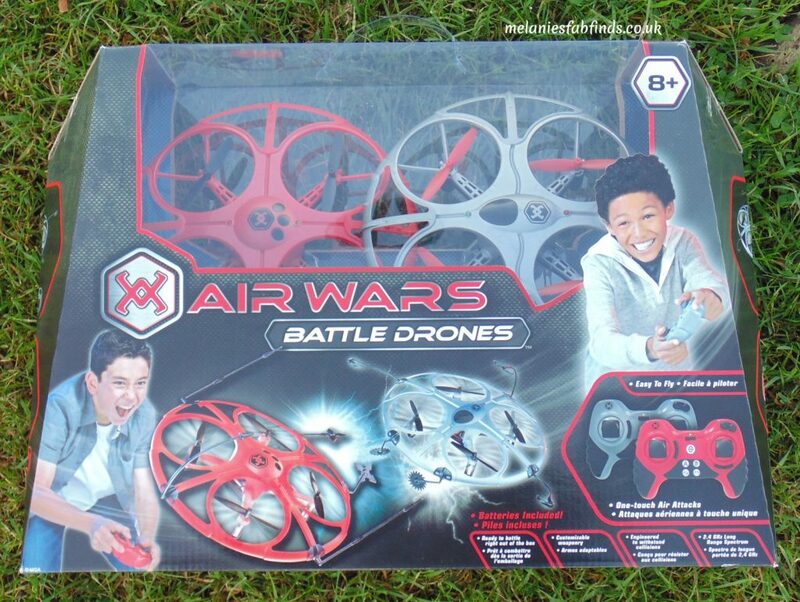 Disclaimer: We were sent the Air Wars Battle Drones for an honest review. 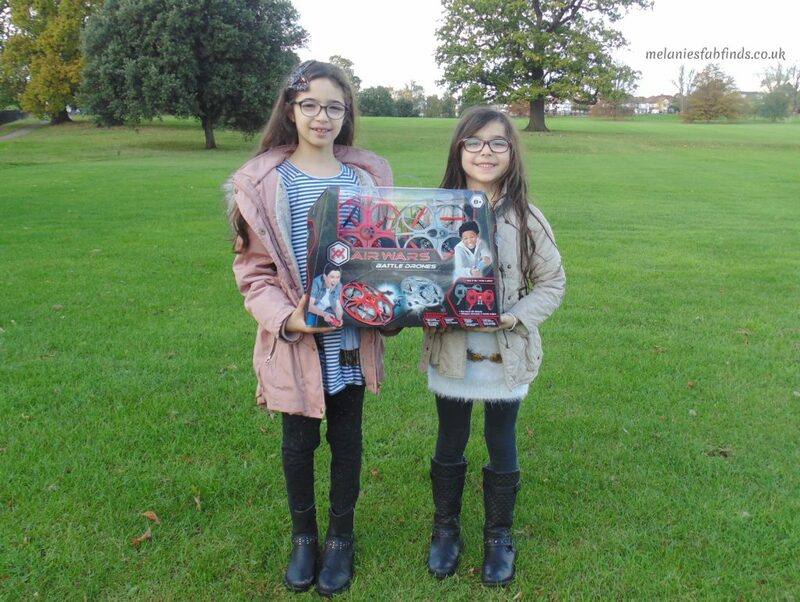 They’ve made it onto the blog meaning they got a big thumbs up from us! Previous PostGift Ideas For Newly Mobile Teens! These sound like a lovely gifting idea for christmas, my young nephews would love these. They sure would they are really good fun. These look brilliant! I’m glad the air blades are guarded. I’ve seen too many drones aimed at kids that miss that simple guard. These are really good although do make sure the children don’t touch until they have stopped. Great for siblings and adults can enjoy these too! What an awesome sounding gift idea for kids hands up as a youngester I would have absolutely loved something like this as a child. Looks like a great chirstmas gift idea and I’m sure they provide hours of entertainment! This looks great. I wish these were around when I was little! They are great toys, we had had great fun with them. Wow, I’ve never seen anything like this but they would be a great Christmas present for kids and big kids alike! They sure would found they they were great fun! It sure would. I know a few adults that would love one. They are really good and the fact that they can battle adds to the fun. Wow, I am amazed that these little girls are the one who are playing the toys. I guess, its already really universal. This is also a great idea as Christmas present to kids. These look so cool – I can imagine that Jack and his Daddy would love it! I am sure they would, these are brilliant! This looks like loads of fun! Bet your children will be masters of these drones soon. WOw, my kids would LOVE these! I’ll have to put it on their Christmas list!